Argh, so you get a Mac and you have used Windows all your life. There is lots to like about the Mac, the laptop hardware, unique apps for writing and more but there are some annoyances. You will obviously buy apps for the computer as it won’t do anything without them unless you only browse the web. The App Store is convenient. You buy the app install it and you are done. Also if you buy from the app store you can, on any of your other Macs, easily install the same program for no additional cost. Also the App Store handles program updates very conveniently, reminding you when you need to update. There is though one drawback of the App Store. Apple has enforced sandboxing. For security reasons sandboxing limits the access of programs to the operating system. But the drawback is that there are some great system utilities that operate by doing exactly this, accessing operating system features. 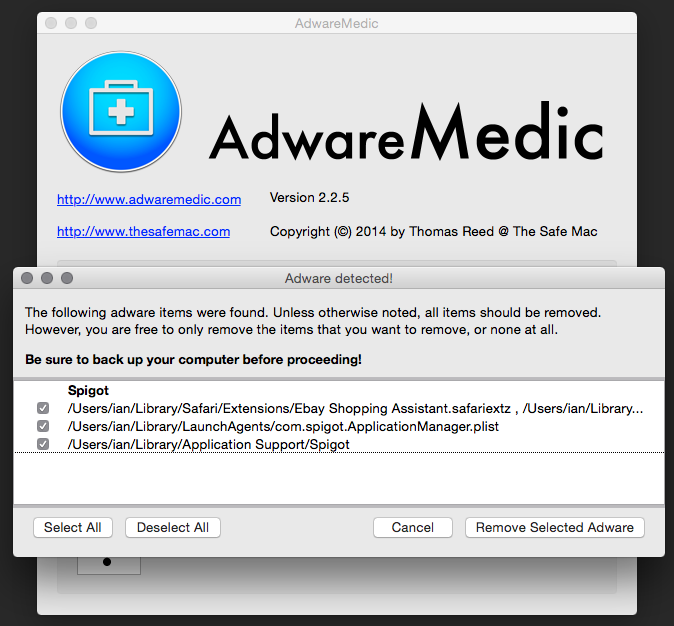 The Safe Mac has a tool Adware Medic which will usually clean any crap in the browsers. The crap below was installed by Tune Up as far as I can tell, which clearly then you don’t want to install. We assure you that our application does not contain any malware. TuneUp is 100% clean and permanently checked for potential threats. We would like to stress that the additional offers are completely optional. You can decline them during the installation of TuneUp and most important the use of TuneUp is not conditioned in any way by them. In case you require further assistance please don’t hesitate to contact us. Yea right! Perhaps I forgot to deselect the “completely optional” offer while installing. The Safe Mac talks about it here. I suggest strongly you read this post now. Mac or PC user. The music library organization app TuneUp, which has been implicated in the installation of adwareÂ in the past, is currently also installing Spigot. All of these are merely examples of apps downloaded directly from the developer’s site that are installing adware or junkware payloads. A productivity enhancer. The more you use it the more you will appreciate it On Windows you can get Breevy for $34.95. TextExpander $34.95 has more features than Breezy. You basically setup abbreviations of common text. But there is more as it also knows what’s on the clipboard. It will synchronize your snippets to TextExpander as long as you configure them both to use Dropbox. And best of all, you can also get TextExpander apps on iPhone and the iPad which also synchronize to Dropbox for the snippets. Another Mac feature is services and Automator. This is very powerful and not really too hard to us. It may get expanded in a further article. For a while I tried the Airmail 2 app in place of the regular mail program. Mostly because I like editing in Markdown. And I don’t use Gmail any more as my email program. Now I’m just using Apple mail for my personal mail and Outlook for work. I have my own account. Switching from Gmail to it was a tough go for a while due to spam. I had to setup Spam Sieve and have it run all the time on my computer at home which I keep running. What about Gmail Tried many, the issue is want a default Mac email program but want to use Google’s search inside emails. All native programs using IMAP don’t work well with search. So the best answer is Mailplane $24.95. I tried MailTab Pro which is free but Mailplane works like a native app and even has ad blocking. I do say it is a pretty good app for free though! And prior to this I tried Fluid which lets you turn a web app like Gmail or Facebook into a real stand-alone Mac app. Kind of cool. What I don’t like about it is when you turn the page into an app, the AdBlock Safari extension is not active. I don’t like seeing so many ads. Alt-Tab on Windows works better I think because it moves you to an application and in Windows the main window is married to the application. But on the Mac when you go MacKey-Tab you get to the app in the menu bar but there is no window open. Then you have to hunt around for the window. But there is a native way to deal with this. Use multiple desktops! So each main application you are using goes on its own desktop. They switching between applications works much better. More on specifics of how to do this to come. I am now using Better Snap Tool, which is a simple app to configure to use the keys to align windows to the different parts of the screen.Â There are some applications also to deal with windows which I’ve previously tried but not using any more as I want to minimize the extra stuff running on my machine. And I’ve got hooked on Keyboard Maestro. I tried it a while back and wasn’t convinced but now I can’t live without it. I have it synchronize via a Dropbox folder, the settings on each of my Macs. It’s worth the learning curve! Get Moom for $10 which allows you to place the windows in the best spots on the screen. Flexiglass, $9.99 I tried Flexiglass but prefer Moom. Flexiglass lets you drag windows around like on Windows 7 and have them snap to different portions of the screen. Alfred 2 which is free but the Powerpack which is generally beneficial is Â£15 and am going to try Launchy which is donationware on Windows. Hazel $25 is a multipurpose automation and workflow enhancer. I mess with it in a simple way but it is very extendable. BetterTouch Tool free and I haven’t used it yet but intend to … some day give it a try. For now I’m sticking with the default Mac behaviours — except for changing the scroll direction of the trackpads to work not like a tablet. Caffeine for free a tiny program that puts an icon in the right side of your menu bar. Click it to prevent your Mac from automatically going to sleep, dimming the screen or starting screen savers. It doesn’t seem to work right with Mavericks, but I will do some more testing and update here in the future. I am now using Carbon Copy Cloner for $39.95 on the Mac. It supports all kinds of image backups including and will clone the OS X recovery partition which Superduper won’t. Also you can clone the disk but keep versions of old files on the backup drive. I like this feature. Superduper $27.95 is another option but CC Cloner has a “more friendly” interface. For file backups on the Mac ChronoSync for $40 is very full featured. It is useful to backup a large number of files as it will compare files before copying to not waste time. It will also prune additional files from the destination if that is what you want. There is also Time Machine which comes with every Mac. I use this for a backup but also use Carbon Copy Cloner to maintain a bootable backup. It is then pretty easy to restore a machine. iTunes has never seemed to run well on Windows. On the Mac it is clearly better and has more features. I had used Tune Up $49.95, a while back as it is supposed to fix mislabeled song information (like Track 01), add missing album cover art, remove duplicate tracks, view lyrics to your favourite songs, etc. It sort of did this. Today, June 2015 I installed it and it made other changes to my computer such as adding plugins to Firefox and changing my home page. So stay away from this piece of garbage, in my opinion now. I recently purchased Metadatics for $10 which is a more manual way of sorting out your song data. Also there is Perfect Tunes for Windows Only. iFlicks for $19.99 is for managing the metadata for videos. It also does conversions. There is also Dupin some apple scripts for iTunes for the Mac only. Noteburner M4V Converter $39.95 Converter to remove DRM for your own use with iTunes files. VLC Media Player is always needed to play files that won’t play with the built in apps. Make MKV for free (well actually I bought it finally as the free version wasn’t usable) to rip from DVD and Blu-ray disks. Handbrake for free to convert media. Works great on Mac and Windows. I used to use DVD Fab on Windows but it started getting too complex and expensive when the above two programs do it all. DBpoweramp Music Converter $38 is a handy windows program if you do lots of CD and audio ripping and conversions. VLC Media player free. A stalwart for Windows also is great on the Mac. Not normally necessary but handy to have around. I’ve used to use Audials £39.90 on Windows. But it was more trouble than it’s worth, so I just run Netscape and a plugin to download Youtube or Vimeo videos. You can try plugins such as “Download YouTube Videos as MP4 or Video Download Helper. Daisy Disk $9.95 on the Mac. A must have program to see the large files bloating up the hard drive. On Windows I use WinDirStat free. On Windows I used ReNamerÂ which is free. Path Finder $39.95 is very useful for handing files. One feature I wish it had was an option when overwriting as to what to do. For example on my old standby Windows programÂ Total Commander you can decide to overwrite older files or not to save time doing backups. I am trying Default Folder X $34.95 (a bit pricy in my opinion). Disk Warrior is now updated for Yosemite. It’s a bit pricy but I might take the plunge. Better Terminal use iTerm 2 donation ware. Note on Dropbox, I use selective synchronization to not fill up the local SSD drive. I am moving away from MS Word into pure text markdown. In early 2014 I am likely switching to Sublime TextÂ though it costs $70. I have been usingÂ MultiMarkdown ComposerÂ but a feature I really want is to have two windows up on the screen at the same time side by side of the same file. That support isn’t in MultiMarkdown Composer and may never be. Byword is a nice Markdown editor with Mac and iOS versions also for iPhone and iPad. Though the best text editor now on the iPad is Editorial. Text Wrangler is the little brother of BBEdit with less features. It is free. For real writing use Scrivener on Mac or Windows. You can use Dropbox for sharing and backup. You can use Scrivener with Marked 2 to show your markdown formatting as you write. MS Office now is subscription for five machines Mac or PC mix. So I have it. Finally, how did I know so much. Filezilla is free and runs on Windows and Mac. But it is really ugly on a retina screen so I’m using Transmit for FTP. There is also CyberduckÂ and ForkLift. DiskTools Pro for $79.99 which I’m not using. Disk utilities but doesn’t seem to be much more than the standard Mac stuff. For heavy duty work you need something like Drive Genius 3 for $99 which (they claim) is used by the Apple Geniuses. iExplorer lets you transfer music, movies and playlists from any iPhone, iPod or iPad to your computer and iTunes. With its user interface, you can view and save your photos, SMS, voicemail, address book contacts and even call histories. iExplorer can also seamlessly mount your iPhone or iPad like a flash drive in Mac’s Finder or Windows Explorer. HyperDock adds long awaited features to your Dock: Select individual application windows just by moving the mouse on a dock item, use mouse clicks to quickly open new windows and many more. I don’t use it. Is a menu bar application to monitor your system status. I’ve got it turned off but it is interesting to see how hot your machine gets when ripping or rendering videos and only costs 99 cents. Mac Power Users is a very good reference.